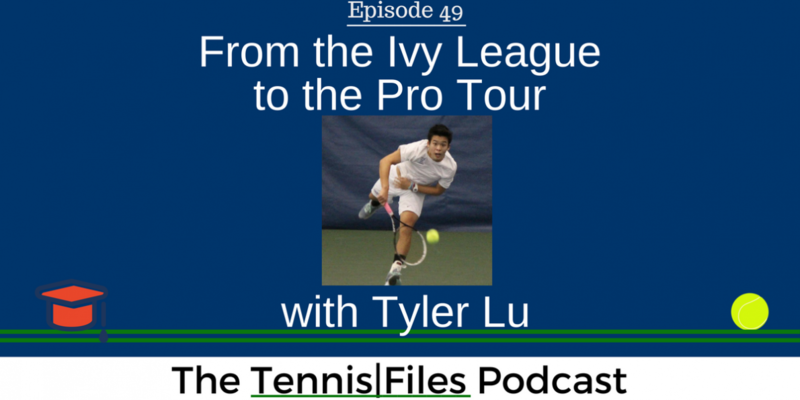 On today’s show, I spoke with Yale standout and recent graduate Tyler Lu. Tyler has played #1 at Yale since his freshman year, and was ranked as high as #64 in the country in college. We discussed Tyler’s journey from starting tennis at 12 years old to transitioning to the pro tour, and some excellent tips that can help improve your serve and mindset on the court. Tyler, a blue chip recruit, has defeated a bunch of top 40 ranked college tennis players and was ranked as high as No. 3 in the Southern California (SoCal) region as a junior and No. 24 in the nation by the USTA. I am definitely glad that Tyler’s brother Austin reached out to me to get this interview set up. Thanks to Tyler for coming onto The Tennis Files Podcast! I really enjoyed speaking with him. Tyler is a very intelligent young man with a bright future ahead of him. I hope you enjoy his very insightful thoughts about tennis and advice on how we can all play better tennis. [4:17] ] Was it difficult starting tennis at a relatively late age? [17:09] Tyler’s playing style, and how it evolved as he got older up until college? [22:13] How and why Tyler choose Yale over other big name schools? [25:12] What part of Tyler’s game he improved the most while at Yale? [30:34] What was a typical day of practice like in college? [32:54] How difficult was it to balance studies at a top Ivy League school with Division I tennis? [34:47] How much off-court training (weight training, agility/sprints) did the team do? [57:20] Will Tyler be traveling with a coach and/or team during this time? [1:01:53] What made Tyler decide to start a blog? [1:05:10] One piece of advice Tyler has for the audience to help them improve their tennis game? If you enjoyed my interview with Tyler, subscribe to The Tennis Files Podcast in iTunes or your favorite podcast app! For more tips on how to improve your game, download a free copy of my eBook, The Building Blocks of Tennis Success below! Thanks for listening!